You cannot deny him. Once the subject of derision, Carlos Santana is now the team’s hottest hitter (picking up the slack for a suddenly slumping slugger in Left). After bottoming out at a .532 OPS on April 18th, he’s put up a .908 OPS to bring his season total into respectable territory. Such a drastic turnaround usually signals a change in approach, and upon a perfunctory inspection, that seemed to be the case. 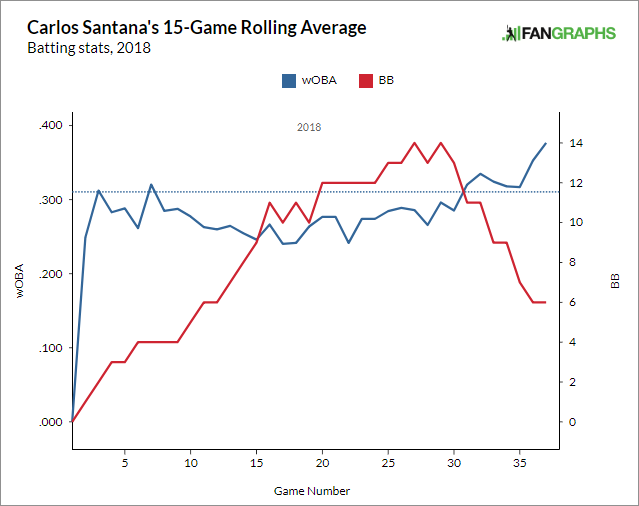 Bear witness to these rolling graphs, and understand my initial hypothesis – that Carlos Santana, walk-master supreme, was walking too much. A walk is a positive contribution. If you gave me a choice between a walk and an out, I’d take the walk every time (unless the walk was a 20 mile hike, then I’d take whatever out you gave me). It’s hard for me to ignore what the graph above might suggest though – that perhaps he was walking at the expense of hits. If his passivity was keeping him from capitalizing on hittable pitches then it should show up elsewhere in his stats. A look at his plate discipline numbers should be illuminating. He’s making contact at a much higher rate – especially on pitches outside the strike zone. This isn’t necessarily a good thing – hitters tend to make better contact on pitches in the zone. In Santana’s case, though, it’s been a boon to his production – he went from a .282 wOBA on pitches outside the zone to a .352 wOBA – roughly the equivalent of going from Billy Hamilton to Jose Altuve. He’s seeing more pitches in the strike zone. Previously, he was near bottom of league. As he floundered, pitchers stopped going away from him. Now he sees strikes at about the league average rate. When I started looking into this, I thought I’d see either a positive confirmation of my hypothesis, OR to see a drastic difference in BABIP to explain his turnaround. BABIP is a tricky creature, a mythical stat that has turned into the go-to for any stats-friendly fan looking to explain an uncharacteristic slump or hot streak. Santana’s BABIP has gone from a pitiful .161 BABIP to…. a still pretty unsightly .182. So…where’s the turnaround? Turns out, it’s all in the power. His HR/FB% was about half of his career average of 13.8% in the early going. Since? It’s recovered back to it’s normal level. He’s making more contact, he’s making better contact, and the results are following. People were right to raise an eyebrow after his early struggles, but the S.S. Santana has corrected its course. Standout Hitter: Nick Williams. The reluctant hero has been on fire as a pinch hitter. One plate appearance is all that he’s needed to change the flow of a game – his 3-run shot carried the team to victory over the Mets on 5/13. Up to last week, Williams struggled at the plate, reaching base about 29% of the time. Since then, he’s failed to reach base 29% of the time (That means he’s reached base 71% of the time, for you math wiz’s out there). Fire emoji, fire emoji, fire emoji. Standout Pitcher: Nick Pivetta. Another excellent start for the young up and comer. Pivetta held the (admittedly not very good) Orioles to a single run while striking out 11 in 7 innings. Pivetta rounds out a formidable front-end of the rotation with Aaron Nola and Jake Arrieta that should keep the Phillies competitive in many games this year. Sit-Down Hitter: Maikel Franco. Two singles and a walk in 4 games isn’t going to cut it. Franco has been at times their best hitter, and at times their worst. This might just be who he is now, which overall is…adequate. Sit-Down Pitcher: Hector Neris. The Phillies would have a 9-game win streak if it weren’t for Neris’s missteps. He’s probably lost his job as the closer. ‘Nuff said. Albert Pujols is a shell of what he once was, so it’s hard to keep in perspective just how good he used to be. Recently, he became the 32nd player ever to eclipse the 3,000 hit mark. He might be the worst player in baseball now, but he’s had one of the best careers ever. James Paxton, fresh off of a 16-strikeout game, one-upped himself by pitching a no hitter in Toronto. Impressively, he only needed 99 pitches to complete the no-no. Brandon Mann, drafted in 2002, made his major league debut on Sunday. That’s not quitting on your dreams. This is only the second worst swing I’ve seen all week. And THIS is the worst swing. Think Bartolo Colon can’t field? Think again.